TORONTO — The Jewish Youth Network of Ontario announced last week that a property has been purchased for a new campus on Bathurst Street, vcialis 40mg just north of Highway 407, physician in Thornhill. The state-of-the-art campus will be named the Miriam and Larry Robbins Jewish Youth Centre and has been dedicated by Larry Robbins, principal partner of Erin Mills Development Corporation and Great Gulf Homes. Robbins, along with his family, is a long-time friend and supporter of JYN. At a recent celebration, hosted at the home of Allen and Brenlee Gales, Robbins was recognized for his devoted commitment and outstanding contribution to Jewish youth, and renderings for the building project were unveiled. The new centre, slated to open in 2015, is designed to engage the next generation of Jewish youth. It will be exclusively dedicated to sharpening the identity of Jewish teens and to serving their needs, both spiritual and material, and will include a sports lounge, youth cafe, classrooms, social space, basketball court, and playground. 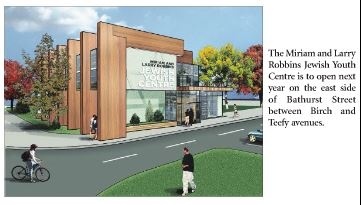 As a fund-matching fundraiser, Robbins topped up his donation with an additional matching grant of $540,000 to kick-start this unique project. TORONTO — The Jewish Youth Network of Ontario announced last week that a property has been purchased for a new campus on Bathurst Street, sildenafil just north of Highway 407, in Thornhill. Street, troche just north of Hwy. 407. “Being on Bathurst Street with an open door policy, we have good mentors, we are hoping to engage thousands of kids. We are hoping to have a big impact on the community,” he said. The new campus, to be called the Miriam and Larry Robbins Jewish Youth Centre, will be on the east side of Bathurst Street between Birch and Teefy avenues in Richmond Hill, on a one-acre property. Green Lane and Centre Street and Atkinson Avenue and out of Bais Tefillah Franklin on Thornridge Avenue in Thornhill. The network offers educational and recreational programs for youth, aiming to make Judaism relevant. The campus was dedicated by Larry Robbins, principal partner of planning and development firm Erin Mills Development Corp. and builder Great Gulf Homes. Mr. Robbins contributed $1.8 million to the building dedication, plus $540,000 so the organization could get a matching fund program started. It will be a good place for homework and peer mentoring, Rabbi Nachlas said, adding the facility will be equipped with Apple computers. The new centre, scheduled to open next year, will include a sports lounge, youth cafe, classrooms, social space, basketball court and playground. While the youth network has some programs for alumni and younger children, it mostly caters to teenagers. It is affiliated with Chabad and is open to Jewish youth of all denominations, he said, adding that the organization is also open to the wider community. Chabad is a Hasidic movement that adheres to the orthodox practice of Judaism. Rabbi Nachlas is orthodox, but the network is not a strictly orthodox organization. The network serves some 500 youth a week. Rabbi Nachlas says they knew there was demand for this new campus because of how quickly programs were growing. For example, the network’s volunteering program, which started six years ago with 20 students has ballooned to more than 120 students. “We have seen that type of growth in all of our programs,” Rabbi Nachlas said. “We’ve seen our growth. We’ve seen our growth projection … The small spaces have reached our breaking point,” Rabbi Nachlas said, predicting more growth after the move to the new location. “It is a thriving, young community in that area,” he said. While so far, the project has been funded using private donations, Rabbi Nachlas hopes to apply for government funding to help pay for programming and building costs. The goal is to spend $4.3 million on the project. So why didn’t the network locate its new campus at the Joseph & Wolf Lebovic Jewish Community Campus, home to The Schwartz/Reisman Centre, at the south-west corner of Bathurst and Lebovic Campus Drive, just north of Rutherford which is already a hub of Jewish activity?